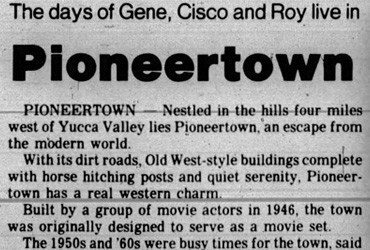 (UP) – The wild west not being so wild any more, a western movie company is turning this desert village into a permanent Cowtown. Then the picture company discovered the place, leased it, and made it one supercolossal movie set. 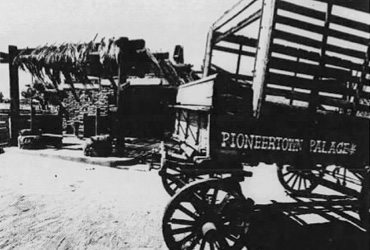 Pioneertown’s great white father is Producer Philip Krasne, who moved his company here for keeps to make “Cisco Kid” thrillers. How you can’t tell where real life ends and reel life begins. These places will be used as movie sets, and in between are propped real false-front sets imported from Hollywood. 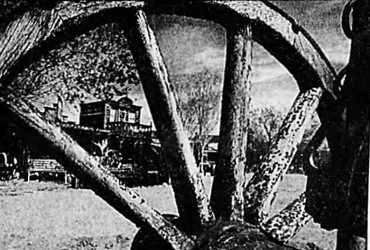 The towns 300 pre-Hollywood residents will get in the act, too. The barber who runs the “Klip ‘N Kurl” place will play barber for “Cisco Kid.” The town electrician will work the klieg lights; the Red Dog bartender will act movie bartender. In Hollywood he’d pay an extra $40 a day when his company was on location. Here he hires local citizens for the standard $15.50. Pioneertown doesn’t have smog or airplanes to louse up scenes, either. And Krasne built a sound stage for indoor shots.